almost came crashing down. Luckily, I was able to catch it and upright the setup. I was a little bit concerned and worried, so I decided to just go back inside. Then as I was pushing the contraption through the door and its wheels over the jamb, one of the legs came out again, and then another leg, and yet, I was again lucky enough to catch the whole thing and return it to a stable condition. Ok, ok, something had to be done. Don't try this at home unless you have checked the stability of your top heavy assembly. My setup is made more unstable because of the narrow hallway that I must transport the telescope assembly though and the separation between tripod legs is constrained to just 35 inches, instead of the normal 43 inches. So rather than adjust/readjust the leg separation when going out/coming in, I just leave the separation fixed but fasten the legs to the wheeley bars. See below. 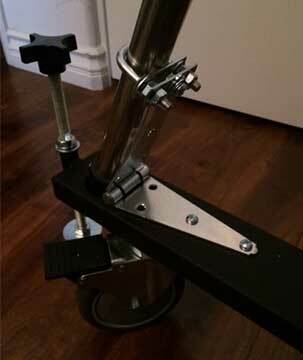 It seems that the U-bolt clamps should be sufficient to keep the legs in place. The telescope assembly still suffers from being top heavy without the same leg separation it is used to, but at least I can breathe a little bit easier now. This home-engineered solution just uses some readily available U-bolts and door hinges and a few nuts and screws and I only had to drill a couple of holes. Well this week has been filled with other backyard engineering jobs of one type or other. 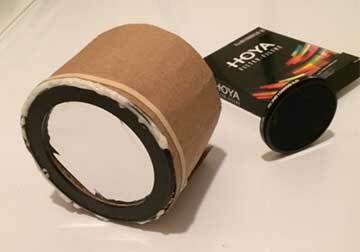 Check out the modification to a solar filter that incorporates a quick slip on sleeve that makes installing and removing the solar filter from the telescope optical tube very efficient. This is especially important when viewing a solar eclipse because the filter must remain in place until totality at which time you want to remove the filter and take images of the sun and corona. But no one wants to be fiddling with the very fine threads on most filters. Now since I am not planning to take the telescope to see the eclipse in Casper, WY, I need to make a similar quick release type of sleeve for my 300mm telephoto lens. The other solar filter shown has 58mm threaded interface to the telephoto lens and it also would be much to difficult to remove and put back on during the eclipse, so I plan to build a similar sleeve for easy removal in the field during the eclipse. In this case, I don't plan to use any engineering principles and again just rely on paper and gluing skills picked up in the first grade. As you can see these skills, just like ridding a bicycle don't ever go away even if they do get a bit sloppy from non-use! Since this post has included a lot of discussion about engineering, and whether you are an engineer and relying on that training or just going back and using your first grade skills, it might be an opportune time to comment on one thing I just started to realize during my transition from engineer to physicist wannabe. The screenshot below is from the Coursera free internet course on Quantum Optics. The class is a bit difficult for the Coursera format, but I really enjoy it, even if the homework is too hard and requires more energy than I want to spend on it. The course and lectures describes the theory of quantum optics and how many times the old Maxwell electromagnetic theory of optics works just fine, and is easier to mathematically manipulate, there are now phenomena that can only be described and explained through incorporation of quantum theory. 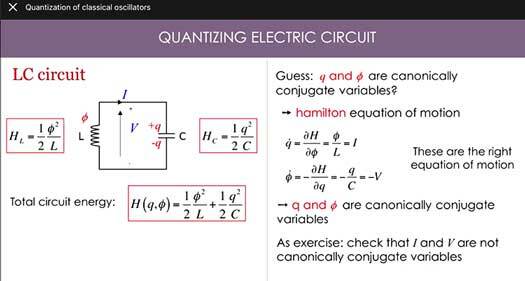 Anyway, this screen shot shows an example of quantizing an electrical circuit and compares how engineers would typically analyze the circuit in terms of voltage and current. Physicists on the other hand want to get at a more fundamental description of the phenomena and make the concept generalizable to other applications, and they describe the system in terms of charge and magnetic flux. It turns out these parameters are more fundamental than current and voltage, even though they are related. Charge and flux turn out to be so called "canonically conjugate variables, which essentially means that they can be used in Hamilton's equations of motion, which is a more general way of describing motion in terms of energy. So, even though physicists might solve this example problem and measure its performance in the laboratory in terms of voltage and current, when it comes to analysis of this and more difficult systems, especially in quantum optics and quantum field theory and gravitational theory, the use of canonically conjugate variables are more effective and illuminating. It's still an ongoing work in progress on this journey as a physicist wannabe. Finally, we should conclude this week with at least one image taken while looking up in the sky. This image, found while just cleaning up the PC hard disk and making room for newer photos, was taken some time back with just my DSLR and 600mm telephoto lens on standard camera tripod. 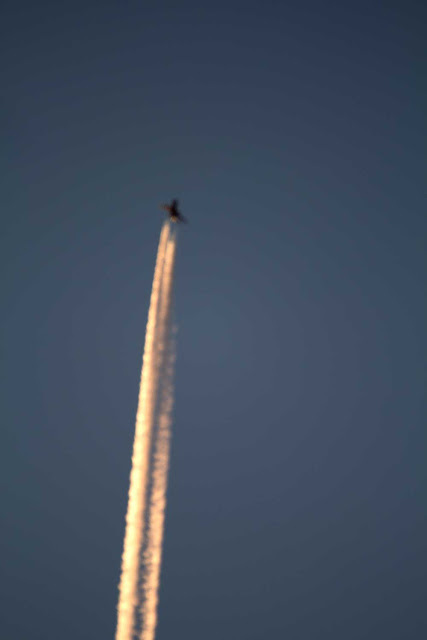 You might have tried to follow a nigh altitude jetliner as if flies overhead and aiming a camera at it at the same time is not that easy, unless, the weather is just right to create contrails. 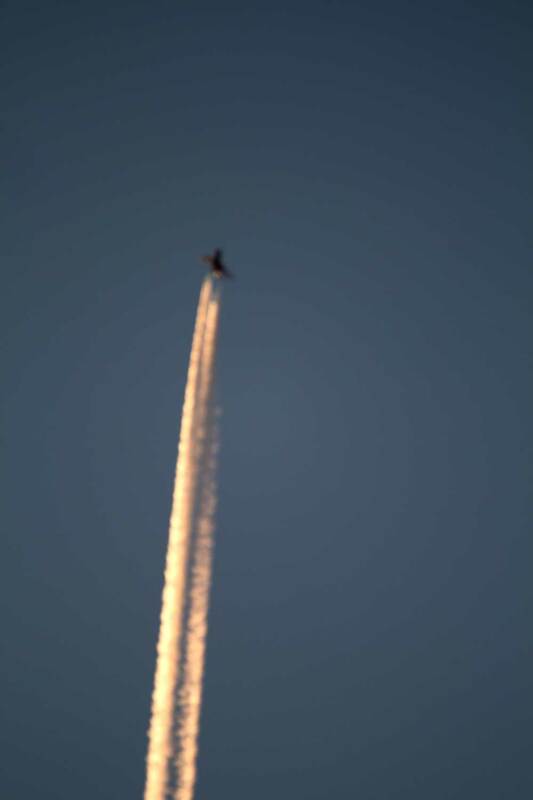 Now in looking at this photo, I have a question for all you photographers and artists out there and that is "Should the photo have been rotated 90 degrees so that the image better matches our preconceived notion of aircraft mostly flying in level flight"? Hmm, I just plotted the photo as it showed up in the camera frame and didn't take any other action, and it seems a little unnatural this way. As a more recent example of photo orientation, consider this photo just posted by OCA astroimager Dave Kodama on his website. 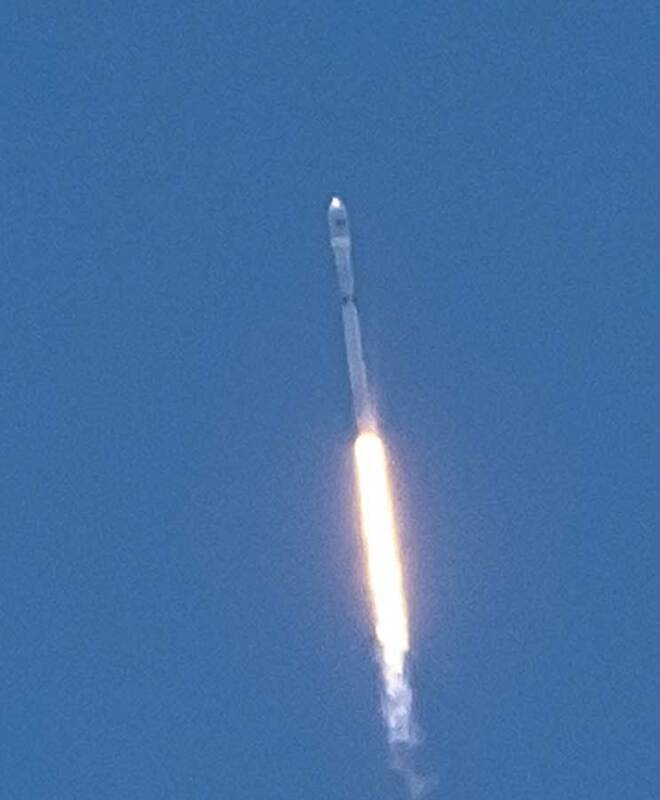 Now this image of SpaceX Falcon 9 launch on June 25 is indeed shown in its natural, expected orientation. Good shooting and thanks for that Dave! See you just have to look up in the sky and you might find planes, rockets, even bats in Austin or elsewhere, and maybe even planets, stars and galaxies. Good hunting and good observing! they require or should prevail to manage necessities of the family.